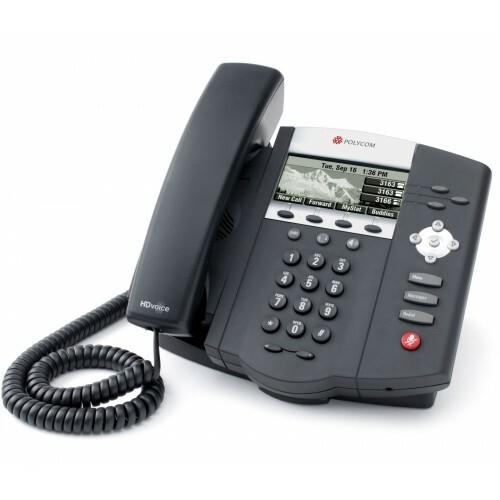 A three­line SIP corded desktop phone supporting up to eight concurrent phone calls, the Polycom SoundPoint IP 450 boasts excellent audio clarity and a comprehensive set of features designed to enhance productivity and optimize business workflows. The Polycom SoundPoint IP 450 features a high­contrast LCD screen with a high resolution and support for multiple languages, including Asian characters. The interface also comes with a built- in XHTML micro browser for accessing and using third­party Web­based apps. This deskphone is designed with ease of use in mind with an easily navigable menu for personalization and everyday use. It also features 17 dedicated hard keys and four context- sensitive soft keys. Additionally, the phone is equipped with a full­duplex speakerphone for hands- free operability. Featuring a premium­quality build and enterprise­ready features, the Polycom SoundPoint IP 450 is an ideal solution for business professionals.